Ever offer to bring an appetizer to a party and totally forget until your pretty much walking out the door to the party?? That happened to me recently. Luckily I had some of these in the freezer! I had made a bunch of these little triangles back in December and instead of baking them all at once I put half in the freezer. I figured they would be perfect for quick mini appetizer if we had friends over for cocktails before going out or even a little treat while watching a football game. Well I kind of forgot they were in there. Good thing! They are pretty much a play on your traditional Spanakopita triangle but with a different filling. I made them with a bunch of ingredients I already had in the pantry. Artichoke hearts, parmesan cheese, sundried tomatoes and mayo. First, I grated the parmesan cheese (I always prefer to use freshly grated parm - it makes everything taste that much better than the pre-grated stuff). To make the filling you basically toss everything in the food processor and pulse it a few times. 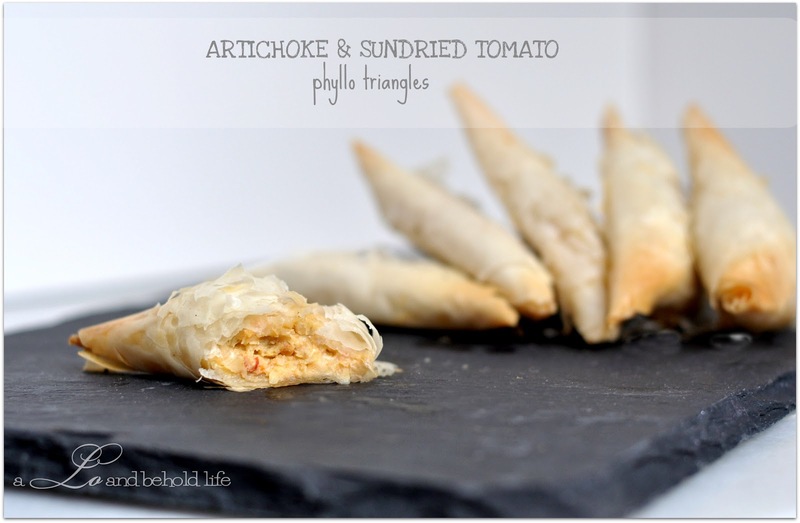 Previous to making this, I admit, I stayed away from working with phyllo dough. Everyone is always saying how hard it is to handle. It's REALLY NOT that hard to work with. You'll be fine as long as you let it properly thaw overnight in the fridge and put a dampened paper towel over the stack of sheets once you've opened it. So once the filling was prepared, I place one phyllo sheet on a clean work surface and lightly spread melted butter over it using a rubber basting brush. Then I took a second sheet of dough, stacked it on top and lightly brush that one with butter, too. Then cut the stack into 4 long strips (lengthwise). 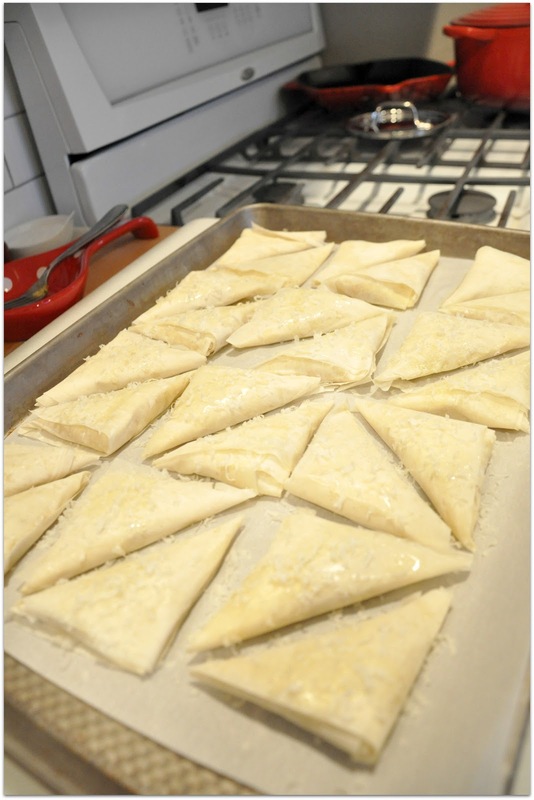 Place a heaping tablespoon of filling at each corner and start to diagonally fold up your triangles. 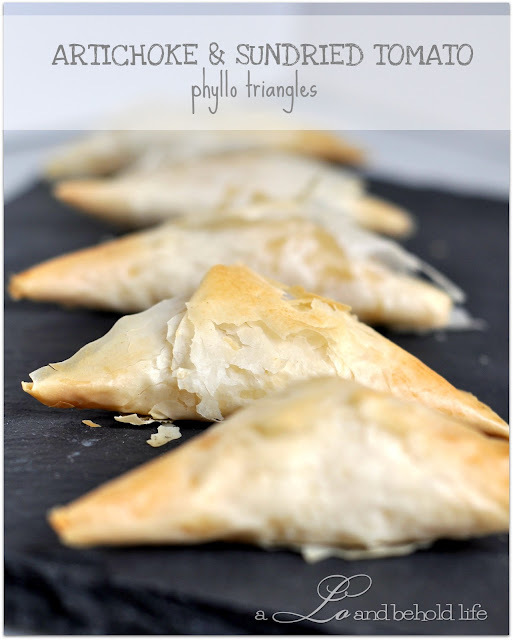 Place your triangles on a cookie sheet lined with parchment paper. At this point you could pack the triangles in a air tight container and put them in the freezer for up to 3 to 4 months. Or if you want immediate gratification for your hard work, bake them for 15 to 20 minutes at 375 degrees F (or until golden brown). In the below batch of triangles, I grated some parmesan over the top of the triangles. I wouldn't recommend this though...cuz it burnt. Hey, you live and you learn, Friends. YUM! Click here for printable recipe. What yummy foods to you have hiding on your freezer for emergency situations?